Happy Thursday! The weekend is almost here. I don’t typically pay attention to the news because it’s always so dark and depressing. However, an old friend of mine posted something on Facebook that caught my eye. It was about a murder case and when I read the article, I felt bad for everyone involved. Unfortunately, this isn’t an uncommon thing when you hear about a wife killing her husband or vice versa. This women shot her husband 15 times killing him. She then tried to kill herself, but she survived. There were no witnesses and not much evidence other than the fact that the husband was dead and the wife was badly wounded. However, if my Ace Attorney training is any good, anyone would conclude the wife had done something. The husband couldn’t have shot her and then shot himself 15 times. I mean… Maybe it is possible, but I don’t really know. Anyway, this couple had a pet parrot. I guess when they investigated around the house the parrot kept repeating, “Don’t shoot” and made funny noises as though he was trying to repeat the gun shot. They believe the parrot is mimicking the husband’s last words. The prosecutor says if they can’t crack the case, he will certainly put the parrot on the witness stand. How crazy (yet cool) is that? In the first Ace Attorney game, Phoenix Wright: Ace Attorney, in the episode Turnabout Goodbyes, a similar situation happens. There is a murder and as the investigation goes, Polly the Parrot gets put on the witness stand for repeating something a parrot shouldn’t have an idea about. I remember when Kris and I first played that game. We burst out laughing when we had the option to put Polly on the stand. We did it, because we thought it would be interesting, only to realize that that was how we were supposed to play the game. Phoenix Wright is a lot of things, but it’s not very realistic. True, you can learn a of from the games from a mystery point. However, the way the court is run in that game isn’t true to life. Then again, neither is Maya and her spirit powers. Having a parrot take the stand? Well, we thought that was just to spice things up a bit. Something to add a little more comic relief. Apparently, there’s a first time for everything. And just about anything can happen. Wow. 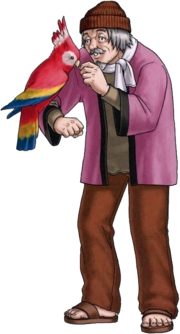 I love Phoenix Wright’s willingness to do ridiculous things like cross-examine a parrot. It’s unbelievable that these things could even happen in real life though. I hope they get someone who’s not corrupt like Von Karma on the case. I know, right? It’s definitely an interesting story to tell. You just never know what’s going to happen.